The noise of Hanoi city can be to some ceaseless, incessant and tiresome, but to classically trained composer Vu Nhat Tan, it’s a never-ending opus. The 44-year-old Vietnamese musician has spent his life fusing classical music with ambient noise and sounds from field recordings to create a series of sometimes serene and, most times, frenetic scores. 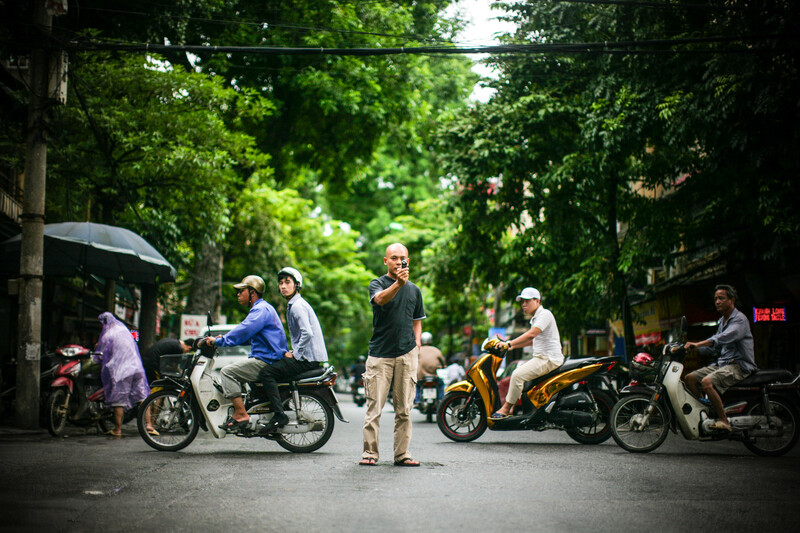 “Here in Vietnam, young people in Hanoi know that I play experimental electronic music, and they call me the noise man – that I play too noisy or too experimental,” says the self-confessed music “purist”. For Tan, the idea of melding the world of classical music and street noise came when he was 10 years old and studying piano at the academy. Tan remembers sitting down sullenly at the piano for his daily practise sessions while carefree children were playing outside his parents’ house. “I would hear the kids playing outside, and I would be inside playing my piano. I listened to them but I continued to play my piano. I just liked that combination,” he says, laughing. That amalgamation of playing piano to the sounds off the streets set off a personal journey for Tan to experiment endlessly with classical and contemporary music, and traditional with experimental music, all in a bid to expand the minds of a fledgling society which has grown up on pop music and nothing else. “In Vietnam, there two kinds of people. There are the young people who only like pop music, and the older generation who only like classical music. To them, there are just these two,” says Tan, a teacher at the Vietnam National Academy of Music where he also graduated from. “But music is not just pop, and not just classical,” adds Tan. As Tan moved from a vinyl era to cassette tapes, he began fooling around with various technology. “When I was a teen, I also grew up on contemporary music. But I would take three cassette tape decks to mix two different tapes, one maybe French pop and the other maybe Vietnamese traditional music together, and then record piano over it,” says the quiet, pensive father of one who has grown up in two distinct and very different Hanois. Yet it’s a place perfect for Tan to marry existential sounds with his classical leanings. His sonic rebellion has seen him perform at countless international music and cultural conferences and festivals, from Ulaanbaatar to Baton Rouge, Perth and Tokyo, just to name a few. And domestically, his music has opened fashion shows, accompanied art installations, played out to clubs and accompanied local TV shows and movies as a soundtrack. Tan’s sound samples come from him physically finding the right sound from around the nooks and crannies of a city he’s in, and throughout his field recordings, Tan has amassed, in his words, “millions and millions of files”, so storage solutions help him stay organised. “For me, I have two laptops, but there is no more space in them. Every time I go out, I look around, and if I hear something interesting, I will follow it and I will go record. “I am always looking for that interesting sound in cities, so after all these while, I have so many files and samples from all these years. “Because I travel so much, I always need different WD external drives, some for storing my samples, some for backing up my music, and I can just take it along with me,” says Tan. “And they have even more space than my laptops,” he adds, laughing, pointing to his two old ASUS laptops. Today, Tan continues to pound the streets looking for that perfect sound, one which sees him embarking on a new musical documentation called Hanoise, as he sets out to document his city aurally – from the fruit lady to the din of countless coffee shops to the endless roar of diesel engines and horns, from the serene Hoan Kiem Lake and chatter of old folks to the night markets and train stations. “I want to finish recording my Hanoi, one of the noisiest cities in the world,” says one of Hanoi’s noisiest musicians. Since 2002, Vu Nhat Tan has turned to stronger work in the electronics field and has himself performed with laptop, electronic equipment and sound instruments. He has given many live concerts in collaboration with other local and international artists. His notable electronic/experimental music appearance includes performing at Hanoi Soundstuff Festival (Vietnam), Hanoi New Music Festival (Vietnam), BEK Piksel Festival for Digital Arts (Norway) and numerous other performances/projects in Vietnam, Singapore, Japan, Australia, France,…He is now teaching composition and music improvisation in the new department for electronic music at the Vietnam National Academy of Music in Hanoi. Nguyen Hong Nhung is a newly emerging artist in Hanoi experimental music scene. Nhung is the person behind the project Sound Awakener, with styles ranging from electroacoustic to noise. She has been releasing stuff on her own or with the help from labels/netlabels. Nhung also provides works for visual/multimedia projects, including the multimedia exhibition “What dreams are made of” in Berlin, Germany. Her recent live appearance includes performing at Hanoi Soundstuff Festival in April, 2015. Nhung tends to create an endless and possibily dark sonic world and time/space deformation by using field recordings, instrumentation, analog and digital manipulation. This results in a variety of different moods in her music – from soft, soundscapes – based tracks to harsh, extreme ones. In some cases, she pushes the sounds to their limits with concrete, dynamic and complex approach. With highly – concentrated textures, rich layering and precise sound arrangement, Nhung Nguyen explores different methods of musical developement to enable a pure form of sound creating and listening. Ever since we started playing together, our goal is to experiment with as many elements and genres as possible. Beside playing noise music and experimental music, we will experiment with genres like IDM with the aim to create a colorful sonic world. And to make our performances more lively and interesting, we will add some (audio)visual to our sets. Since we are both piano players, we decided to perform together as a piano duo. Moreover, we will perform on both acoustic piano and digital piano. Since acoustic piano and digital piano have very different sounds and nuances, this is going to be a great chance for new expression and interaction between the two performers.